During the school year, each teacher selects the themes for her class and sends home a monthly overview which we publish in our Announcements section. During music time every week, the children make interesting discoveries about the many sounds that we can make with our voices, body parts, and musical instruments. The music teacher accompanies songs with playing the guitar and children use rhythm sticks and other instruments. 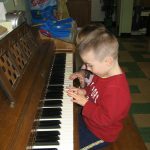 Children learn simple music principles i.e., rhythm, song melodies, etc. This special music time is in addition to daily teacher and child lead songs and music (Spanish & English songs). A few highlights of some of the musical learning activities are: making musical instruments, creating songs, children forming a rhythm band outside on the playground and painting at the easel while listening to music. We use hands on activities to create and explore a variety of art mediums to learn and discover things through our experiences. Students work with various media including watercolor, papier-mâché, sponges, clay, collage and assemblage pieces. 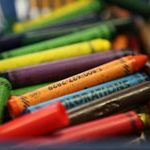 Through art and craft projects, students gain valuable skills, such as: following directions, self expression, creativity, color recognition, shapes, textures, sequencing and fine-motor skills. Language development flourishes in the early years. We incorporate Spanish immersion, English, and American Sign Language exposure and experiences. Our teachers help the children become comfortable with language through individualized interaction, as well as books, songs and daily activities. Children are asked questions about the world around them and stories being read to help their vocabulary flourish. Each child is listened to and interacted with respect and value for their words and thoughts. American Sign Language is introduced during story times and daily activities to bridge the gap between a child’s ability to understand language and his ability to articulate it. Another benefit with introducing ASL in the early classroom is it builds self-esteem. Since ASL is very visual and often iconic, signs are quickly learned, understood, and used to communicate; offering a strong sense of empowerment. Our Spanish immersion program is led by bilingual teachers who are native Spanish speakers. Children enjoy the many benefits of early foreign language acquisition. Children learn to understand and speak Spanish by hearing their teachers and peers read stories, sing songs, and discuss such routine activities as eating lunch, going outside and washing hands in Spanish. Early development of number concepts is critical in developing positive attitudes about mathematics at an early age. Young children need to experience a lot of ‘doing’ and ’saying’ before written numerals will make sense to them. We give children hands-on experience with math concepts through manipulative-based activities. 1) One-to-One Correspondence (matching one item to another) – using real objects to count, add and subtract as opposed to rote memorization. 2) Critical Thinking – when children play a guessing game or try to figure out how to manipulate an object they are developing. 3) Problem Solving – figuring out how to make something fit or balance. Children may make puzzles using construction paper and glue the pieces in the correct place and do numerous activities using blocks, legos, peg boards and graphs. 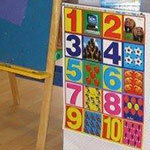 4) Number Recognition – number recognition is enhanced through creating numerals with different mediums. Songs, games, finger-plays and the daily calendar also play a part in understanding the relevance of numbers. 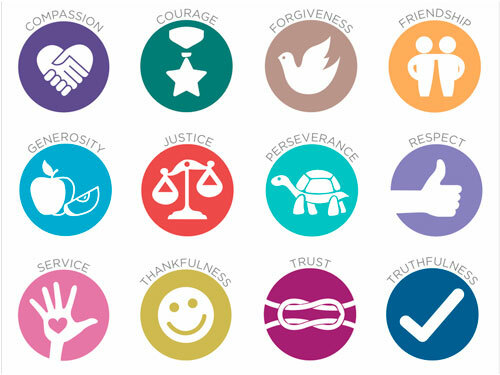 Christian stories, songs and simple prayers like “God is great, God is good and we thank him for our food” are a part of the Christian values based program. The children will learn about the baby Jesus at Christmas, the meaning of Easter (and the many symbols of Easter), the story of St. Patrick spreading Christianity, Noah’s Ark, creation and other stories at an age appropriate level. Bible verses and songs like “Jesus Loves The Little Children” are included in activities. Students explore physical, earth and life sciences through various themes and the seasons. 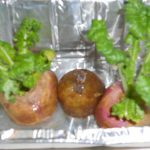 In the spring, the children may grow beans and flowers in clear plastic containers so they can see the roots, stems, and leaves grow. The life cycle of a caterpillar into a butterfly is explored and the concepts reinforced with creative, fun activities. Child initiated activities are carried out, such as digging for worms and classifying them. In the fall many changes in the weather, trees and animals are explored. Thanksgiving leads to learning about where food comes from and what life was like for the early settlers without electricity. In the winter, the children will explore snow, ice and temperature as well as how some animals travel to warm places and some animals hibernate. Other common science topics include: space, ocean life, sink or float, cause and effect, and health. 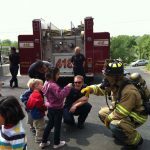 The Falls Church Fire Department visits us to talk about a Firefighter’s job and talk about fire safety, 911 and learn about safety rules that are age-appropriate. A Dental Hygienist comes to talk to us about dental health and demonstrates proper brushing. Many talented parents also visit the school and teach our students about their professions. Children take a playground break in the morning and afternoon. Our playground area has a sand box, slides, climbing structures and other age-appropriate equipment. We also vary the play routines to include activities such as: large assortment of balls, blowing bubbles, small trucks to push and games. 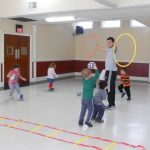 We have a large indoor area for gross motor activities when the weather does not permit us to play outside. The children engage in both structured and unstructured play. During unstructured time, the children are free to “make-believe” or play with balls, hoola-hoops or other equipment. More structured gross-motor play may include parachute play, obstacle course, ball games and circle games.